Very well made, if a tad too footnote-heavy – but why ‘Hamlet’? Well, if you love good, intelligent, meaningful cinema, then 'Haider' is your film of the year. Even if you are fluent with Hamlet, there will be alot you can take away from Haider. I guess, this film is the best all those who are associated with it can get. Its deliberate pacing may not work for all, but this is a solid, well-acted movie that deserves your time. I'm going with three-and-a-half out of five. To see or not to see? Do you really have to ask? 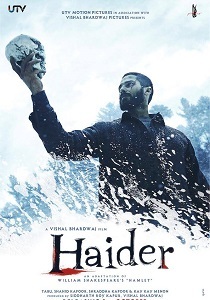 “To be, or not to be: that is the question…” To watch Haider, or not: that is the question. Starting with neatly told crime boss tale to a haunting effect in Maqbool (Macbeth), mixing desi liquor with Shakespeare wine in ‘Omkara’ (Othello) to a knock out effect, Vishal Bhardwaj’s third and final dip into the Shakespeare valley ‘Haider’ (Hamlet) is technically brilliantly crafted and exceptionally acted but cinematically it’s shockingly and surprisingly a hit and a miss adaptation of Shakespeare’s masterpiece. To watch or not to watch? That is the question. Haider is packed with memorable scenes and an underlying message, which stays with you long after you have left the cinema hall. The director treats the topic of political unrest in Kashmir nicely, and tries not to take sides. Yet the movie is not overtly sentimental and delves into the psyche of the characters and the effect the war has on them. This movie has a few minor pitfalls here and there, but otherwise it is a wonderful effort by Bhardwaj, and deserves to be watched. While this is far from his weakest effort, and better than most directors' strongest, Vishal Bhardwaj's Haider is only his third best Shakespeare adaptation. Haider is a beast that just won't be tamed by regular cinematic definitions. तीनों ही फिल्में शेक्सपियर के ओथेलो, मैकबेथ और हेमलेट का अडॉप्टेशन हैं। विशाल भारद्वाज की इन फिल्मों की खूबी यही है कि किरदार कहानी से इधर-उधर नहीं भटकते और ना ही फिल्म के अंत तक. The turmoil in the state at the time, and the turmoil being faced by Haider tie in wonderfully. Overall, Haider is one work of art with creativity at its best! Dark, bleak, morbid and absurd, it is a Shakespearean tragedy and a Vishal Bhardwaj film through and through; and a fantastic one at that. Haider' is a cinematic piece of brilliance Bollywood will always be proud of. Don't miss Haider - he's got chutzpah like none other. Haider is only his third best Shakespeare adaptation. Don’t miss this film at any cost!!! To see or not to see is no dilemma here. Don't miss Haider - he's got chutzpah like none other. Because, Haider had every reason to go Bang, Bang! Haider movie review: Shahid Kapoor and Tabu stun you with their performance in Vishal Bhardwaj’s desi adaptation of Hamlet! Shahid, Tabu steal the show! There is much in Haider that deserves a standing ovation. Let’s start with the courage of director Vishal Bhardwaj. Hamlet is one of Shakespeare’s most difficult and ambiguous texts. It’s also his longest— it takes over four hours to deliver.